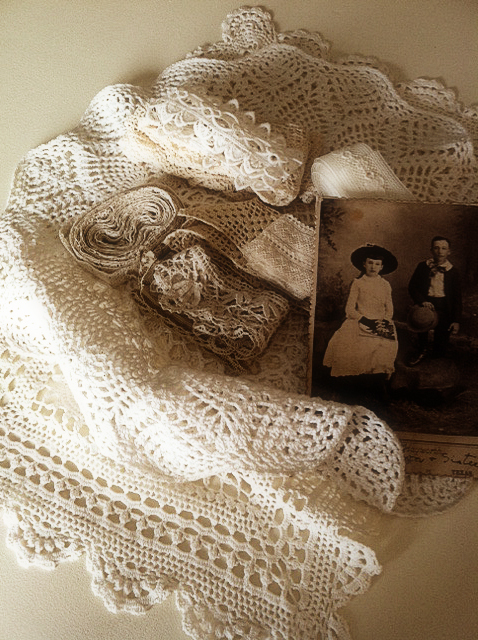 Doilies and lace trims that were added to my collection this week. I also found this delightful cabinet card from this Etsy seller. Do you see that she is wearing fingerless gloves? So adorable and chic. Her brother is very handsome as well. Lately, I have been drawn to these vintage photos. Child subjects are particularly interesting to me. I have a number of old baby ones, and maybe it is the unpredictable expressions and poses I love. Do any of you collect these old vintage photos? How do you display them? Right now, quite a few are displayed in my studio, but there are also some throughout the house that are part of my cloche ephemera. I am getting ready to visit my son, daughter-in-law and grandson in Charleston. Master Eli will turn one year old, very soon! We are missing him so much. The weather is so nice there, I am looking forward to getting my vitamin D the old fashioned way, and not in pill form! The sun has been scarce around here. Eli is a real beach lover and we will be spending our time on Kiawah Island while we are there. When I get back, I will be putting the finishing touches on the studio and getting back to work, finally. I've seen so many wonderful altered paper projects that use vintage images. I'm really drawn to them as well. I always want to know their story :). I have several old doilies and a few old hand sewn table runners, made by my husbands Aunts. I'm thinking about a shadow box for displaying.